I've been using Google's Cloud Print service for a few months, and it has made organizing my printing needs much less complicated. I use a variety of devices (desktop, netbook, work computer, and android phone), and it can be a hassle to get behind my desk, just to plug the printer into my netbook. Or to copy a file to a USB drive, then open it on my other computer. Or to remember to print a document at work that I've been working on at home. 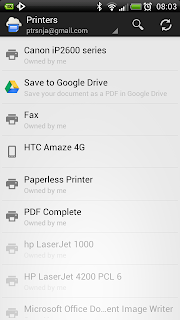 This service connects your local printer to your Google account, enabling you to print to it from virtually anywhere. Because I use Google Drive for the majority of my document needs, I've found Cloud Print to be great. You can view and manage print jobs from directly within Chrome browser. You can add a virtual print service to your computer to enable printing to Cloud Print from any application on your computer. But one of the most convenient features that I've used is the ability to print directly from the Chrome browser on my mobile device. I often use my phone to look up information when I'm on the go. Prior to using Cloud Print, I would have to go on my computer, check the history for my phone's web browsing (yes, that's another thing you can do with Chrome), then pull up the same page and print it. Not too difficult to do, but I'm forgetful enough that I would often overlook doing this later in the day. 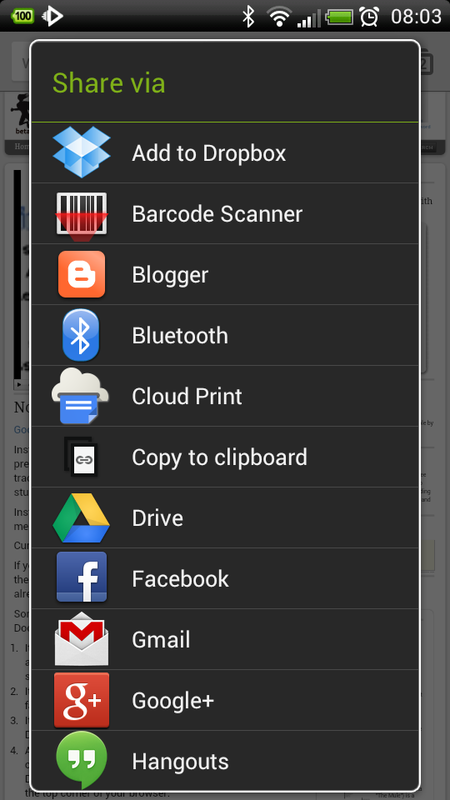 Using Chrome Browser coupled with the Cloud Print App, now all I have to do is go to Menu - Share... on my phone, then choose the option to print to my cloud printer. If my computer at home is off, the job is stored until the printer becomes available. 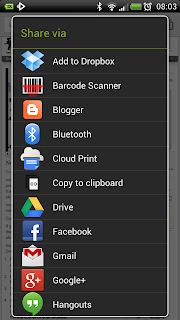 To be able to print, you'll need both the Chrome Browser and the Cloud Print apps available from Google Play. Both apps are free. You will also need to add your computer's printer to the cloud print service, or choose a cloud-ready printer if you're looking to make a new purchase. 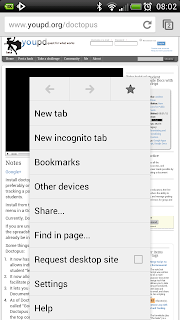 First, open the page you'd like to print in Chrome Browser on your device. Then, press the menu button to open the context menu. You should see a similar screen. Click on the Share... option. You can now choose to "share" this webpage with the Cloud Print app. This can be a little counter intuitive (why would you share it with a printer, and not just print it? ), but stay with me here. You're actually sharing a webpage between two apps - the Cloud Print app just happens to be a print service. The final step is to select your printer from the list. Once you've done that, the print job will be processed and sent, and when your printer is online and connected, your document will happily appear in your printer tray. Isn't that easy? 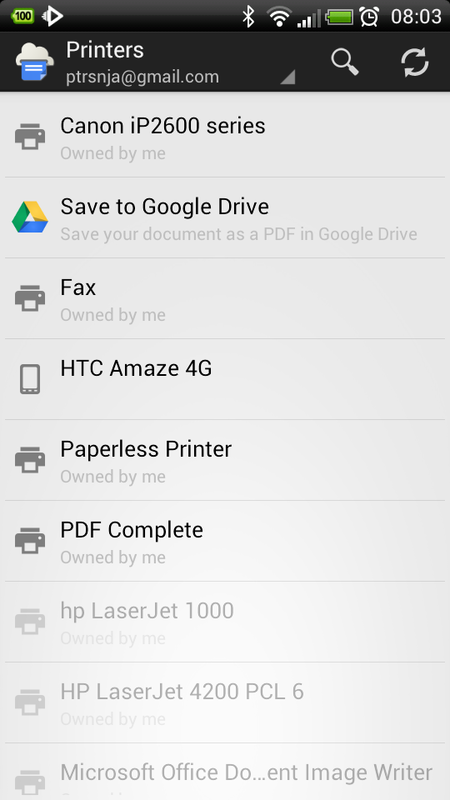 Another great feature is the ability to share your printer with others easily. It's as simple as sharing anything on Google Drive - you simply invite the user to add the cloud printer by email. Students can easily print to a classroom printer without all the mucking about with cables, greatly speeding up the process. Because you can manage the queue, you can also see when a print job was added, and by whom. This could come in handy if there's a deadline for an assignment that has to be printed. I'm trying to move away from using paper copies as much as possible, but there are time when this just isn't feasible. 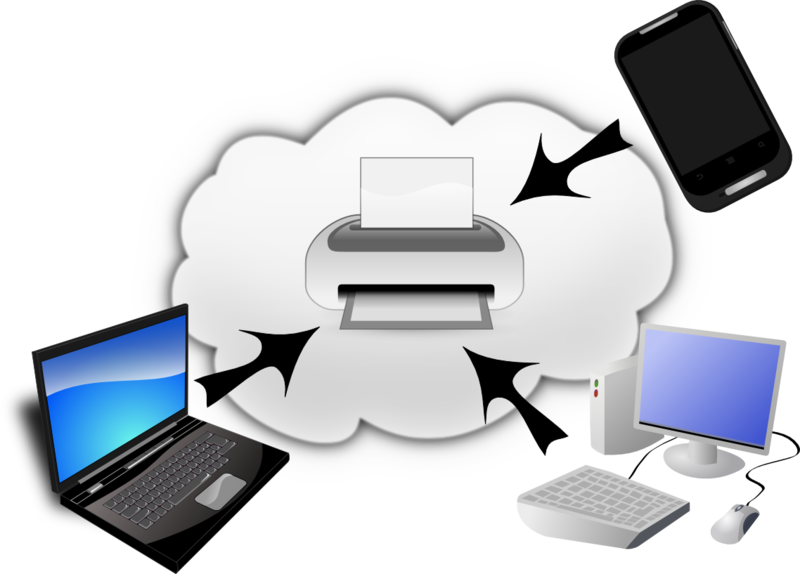 For those times, I use Cloud Print to manage my printing from multiple devices to just one printer. And the greatest feature? It works with any printer that's currently working on your computer, so you don't need to shell out for a cloud-ready model (although my next printer will likely end up being cloud-ready). For more information, check out the comprehensive FAQ that covers many features that I don't have enough space to mention here.